1 of 1 Combine watermelon, honeydew and cantaloupe in a large bowl. Set aside. 1 of 2 In a medium saucepan, combine sugar, lime juice, jalapenos and 2 tbsp water. Bring to a simmer over mediumhigh heat and cook for 3 minutes. Remove from heat, strain out jalapeno pieces and cool completely. 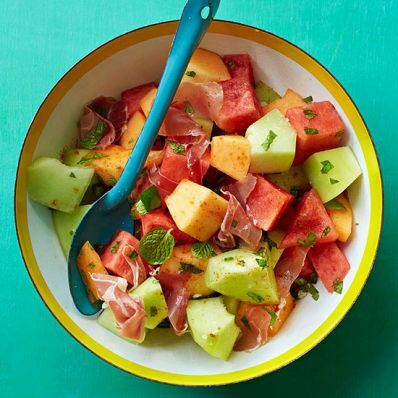 2 of 2 While syrup cools, add prosciutto, mint, salt and cayenne to melon in bowl. Pour syrup over salad and stir gently to combine.